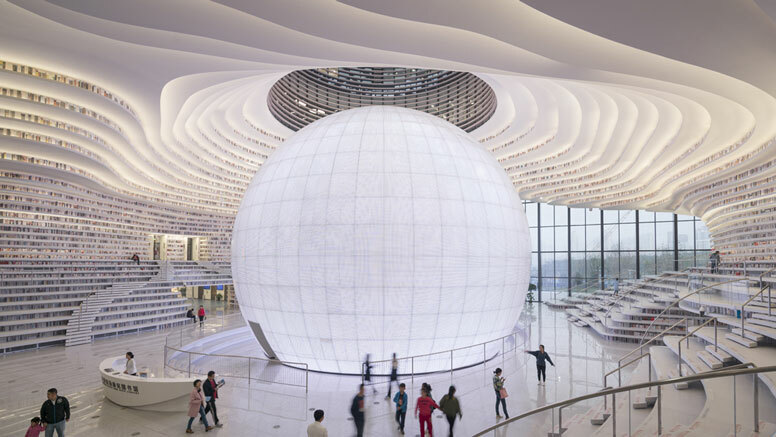 Dutch architect MVRDV has completed a public library that looks like a giant eyeball, as part of a new cultural district in Tianjin, China. 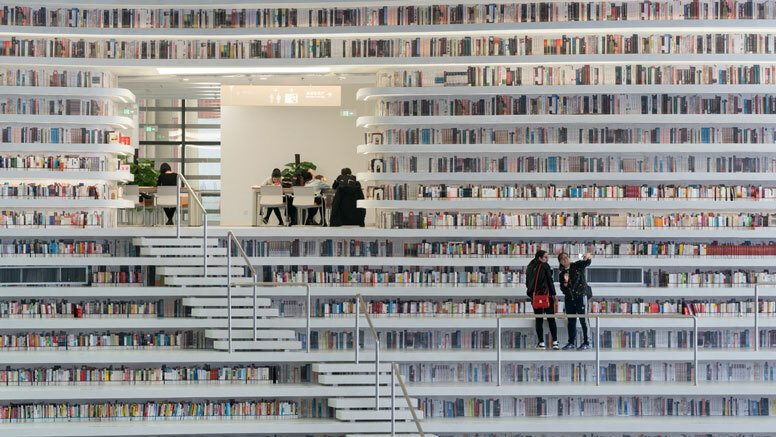 Tianjin Binhai Library is part of a larger plan to provide a cultural district for the city. The building acts not only as an education centre but as a connector from the park into the cultural district. An oval opening punctured through the building is propped open by the Eye, a mirrored sphere with an auditorium, which takes the main stage within the atrium and enlarges the perceived space within. Terraced bookshelves which echo the form of the sphere create an interior, topographical, landscape whose contours reach out and wrap around the façade. In this way, the stepped bookshelves within are represented on the outside, with each level doubling up as a louvre. The five levels of the building contain an extensive programme of educational facilities. The subterranean level has in it service spaces, book storage, and a large archive, while above this on the ground floor are easy to access reading areas for children and the elderly, the main entrance and access to the cultural complex, the auditorium and terraced access to the floors above. The first and second floors consist primarily of reading rooms, books and lounge areas, and the top two floors also include meeting rooms, offices, computer rooms, and audio rooms. A review of the project by Dezeen. The project and its gallery of photos by MVRDV.